Do you have sourdough to discard? Well do not get rid of it, it can be reused. You can keep this one in a big jar in the fridge and at least once a month do something with it. You can do pancakes, or waffles or pizza or even bread. This is what happened to me, I wanted to reuse the sourdough but not to make anything else special than simple bread. To this particular bread, the sourdough is not the main raising agent but the yeast. 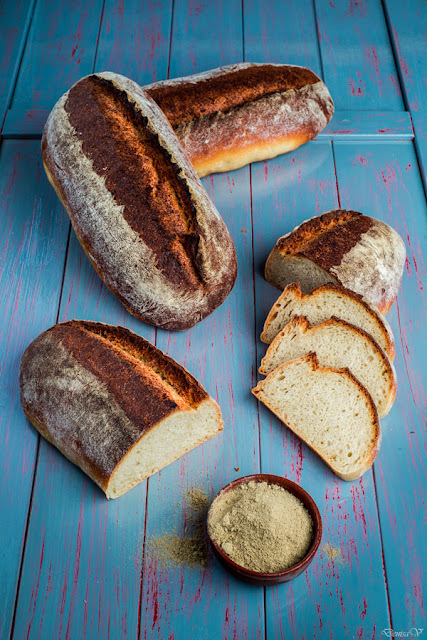 The sourdough comes with its specific taste and enriches the bread. The 20g of yeast will definitely work much fasten than the sourdough. This is an exotic bread I would call it. It is durum but with cardamom flavor. Have you ever tried it? Is a specific spice that can give interesting taste even to your cofee. The 2 taspoons of cardamom will give a very light taste. If you want a stronger flavor double the quantity of cardamom. The resulting dough was very easy to work with and in the oven gave me a lot of nice surprises. IT opened the bread so beautifully and created ears to all my 3 bread. 13:45 Mix all ingredients with a standing mixer for 10 minutes. 13:55 Cover the bowl with a lid and let it stand at 22ºC for 3 hours. This is the bulk fermentation phase. 16:45 Divide the dough in 3 and shape 3 oblong loaves. 17:00 Put the dough in bannetons and cover with a linen towel. Let it stand at 22ºC for the final fermentation around 1h30". 18:00 Turn on the oven at 260ºC with the baking stone inside and the volcanic stone in a pan under to help creating steam. 18:40 Score the loaves with a blade and put them in the oven on the hot stone. Bake them for 15 minutes keeping the same temperature. After the 15 minutes, reduce the temperature to 220ºC and continue to bake for another 30 minutes. This recipe was inspired from Pain maison : Spécial machine à pain- Cathy Yta, page 54.